This album features the acclaimed “The Farming Boy” and “Frost on the Larch” and hasmet with overwhelming critical support. "Anna gets right to the heart of the matter whether singing of childhood memories, the simple beauty of frost on the larch or political pandemoniumin far flung countries. “A Little Piece of Africa is a phenomenally humbling song proving that Anna is politically conscious,morally astute and gifted beyond comparison as a songwriter. 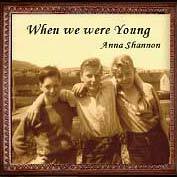 Anna epitomises exactly what it is to be a folk singer." Steve Rudd for Moonbeams Acoustic.